If an indoor golf facility can succeed in sunny Southern California, it can make it anywhere. That's exactly what Ultimate Indoor Golf (UIG) did. Now they've opened their second location in the heart of Bellevue, Washington. Joining forces, the company is placing golf simulator facilities in LA Fitness clubs around the country. Bellevue is their second collaboration. UIG is the brainchild of Herb Meistrich, founder of the TaylorMade Performance Labs. At UIG, you can play or practice in a comfortable, climate-controlled, indoor setting. Play iconic courses like Pebble Beach, Torrey Pines or Kapalua; day or night - rain or shine. Play 18 holes in an hour or less, at a fraction of the cost of a round of outdoor golf. 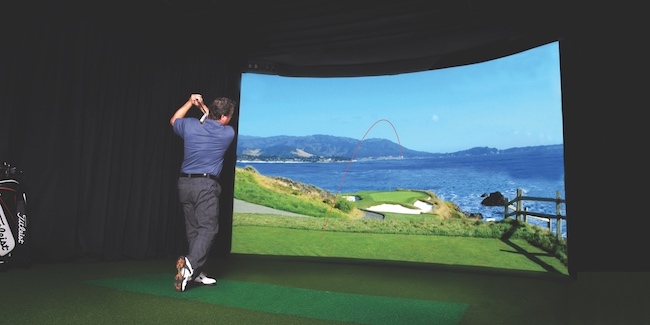 Three high definition golf simulators provide a unique, exciting, golf and entertainment option. It's an ideal venue for golfers to hone their skill or just get in a little golf when pressed for time. "For someone like me who doesn't have 4 to 5 hours to play regularly, this is perfect. I can play 18 holes against a buddy in an hour and a half have a great time and be back at work. Just a super way to practice if you can't go out to play 18," says Bob Hochstadter (Mission Viejo, CA). It's also a terrific opportunity for new players to try the game in a friendly, low-pressure environment and the perfect way for parents to introduce kids to golf. LA Fitness membership is not required to play at UIG. At UIG, improve your game, regardless of age or ability level using TrackMan - the Gold Standard of golf simulators. TrackMan is used by more than 350 Tour Pros including Jason Day, Dustin Johnson and Rory McElroy. Referring to TrackMan, Rory states, "I own one, and I use it regularly...when I was struggling with my swing a little bit last year, I started using it a lot. It's a really helpful tool if you use it correctly." Trackman is the launch monitor of choice for the world's top golf instructors, custom club fitters, equipment manufacturers and the PGA Tour itself! Whether you play 18 holes or practice on the range, TrackMan tracks all your statistics including launch angle, ball speed, club head speed, angle of attack and much more. UIG then saves them in your virtual locker. "I think of the HD Golf facility as my Golf R&D Lab. It's where I try new things with my swing and hone my game. Believe it or not, even my putting has improved since I've added HD Golf to my game. It has taken my game to a new level," says Ken Gryske (Irvine, CA). Operations manager Doug Kauffman (PGA) has worked as Director of Golf at The Members Club at Aldarra and Head Pro at Bear Creek Country Club. Doug's golf passion revolves around events, tournaments, leagues and helping others improve. He discloses, "I'm excited because Ultimate Indoor Golf provides me a unique opportunity to run leagues and events in a year-round capacity, without interruption for weather, course conditions or even darkness. Seattle has a large population of passionate golfers. This is a perfect setting for them. No frost delays, no pace of play issues." Ultimate Indoor Golf is offering a first round (one-hour session) at half price ($19). UIG is so sure you'll love it, if not completely satisfied, your round is FREE. Visit www.ultimateindoorgolf.com or call 425.455.3335 for details or to register. A Grand opening event is scheduled for Saturday, March 11 & Sunday, March 12 (8 AM - 8 PM). Free demonstrations of the facility will be available throughout both days. There will also be drawings and contests for exciting prizes. Food and drink will be on hand. Don't miss it!